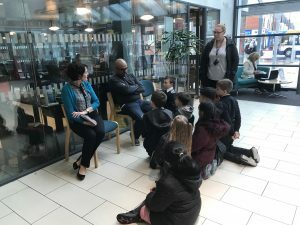 The Beacon was delighted to welcome school pupils from Years 3, 4 and 5 at Hawthorn Primary School as part of their Enterprise Week at school on Monday and Tuesday this week. The visit was facilitated by three of our tenants at the Beacon: TJ Gill of Studio 44, a media company; Shehla Rashid of Noor Couture, an Asian fashion business and Amer Mirza of Dine @ the Beacon. 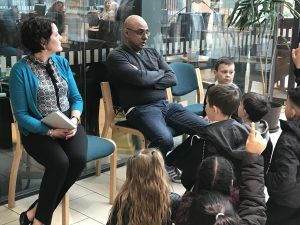 All three of the business people discussed with the students what their aspirations were as young people, how they ended up doing what they’re doing now and how they continue to develop their businesses. The students were then able to ask questions and answers to TJ, Shehla and Amer.